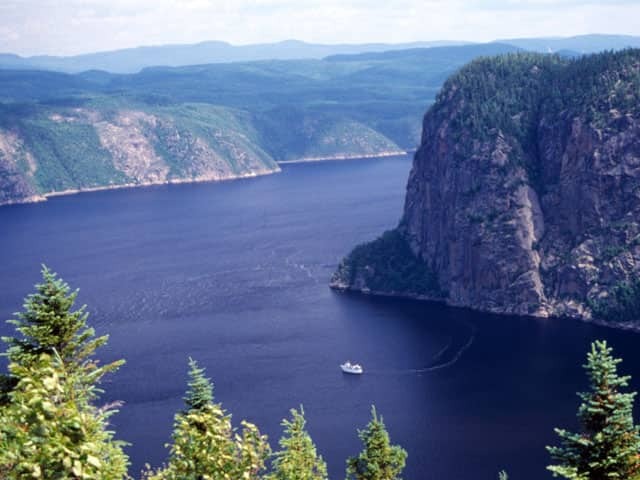 The one, the only, the envy of Norway… the Saguenay Fjord is Quebec’s largest fjord. The fjord allows the water of the Atlantic and the Gulf of Saint-Lawrence to flow into the Saguenay “Kingdom.” Didn’t know Canada had a kingdom? The name “Kingdom of Saguenay” comes from an Algonquin legend learned by the French during colonisation in the sixteenth and seventeenth centuries. According to the Algonquin Indians, there was a kingdom to the north, of blond men rich with gold and furs, in a place they called Saguenay. French explorers in Canada looked for this kingdom in vain. Perhaps the real treasure was right under their noses… the fjord itself. The Saguenay Fjord is one of the largest yet least known Fjords in the world. Granting access to the mineral rich heartland of central Quebec, the Saguenay Fjord is an essential piece of the St. Lawrence River seaway. Starting at the St. Lawrence River, the fjord stretches through the Laurentian Mountains, deep into the Canadian Shield. The fjord is home to both salt and fresh water species including Beluga whales, Minke whales and Greenland sharks. Champlain considered the fjord the access to the fabled Saguenay Kingdom. The Saguenay Fjord is unique in its location, history, and people. Growing up in the region has given me a profound respect for nature and a strong identity. As I always said, my "roots run deep into the Saguenay Fjord". If you climb the cap Trinity you will be in awe with its beauty and majestic presence. The fjord itself was created over 4 billions years ago. … It drains the water of the catchment basin that covers 88,000 km2 and it 550 km long. I have left the region and now live in Calgary, but whenever I need peace of mind I close my eyes and there I am again. 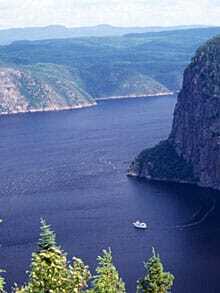 Everyone in Canada should have the opportunity to visit the Saguenay Fjord and they too will be spellbound. It's a river! No, it's a fjord! Whatever it is, the stretch of water running from Chicoutimi down to the St. Lawrence is breathtakingly beautiful. The Saguenay Fjord is one of Canada's little known treasures. At 100 km long, it is one of the longest fjords in the world, and is the only navigable fjord in North America. Its sides are lined with a series of granite capes and escarpments….